Newt “Neuter Cooter” Rayburn of the Cooters. In 1994, after giving it a go in other bands, three boys who grew up in Oxford circled back to each other and formed the tightest, heaviest trio the town had ever heard. They haven’t turned it down yet. In two decades, the Cooters have lugged their gear into countless bars and have recorded several albums—including one at legendary Ardent Recording Studios in Memphis. Along the way, they’ve had additional members come and go and performed as “Megacooter” in these larger formations, but the core trio that’s held it all down since 1994 is Newt Rayburn (“Neuter Cooter”) on bass and vocals, Gentry Webb (“Raw Cooter”) on guitar, and Mikey Namarato (“Judas Cooter”) on drums. 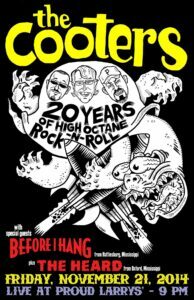 This Friday, November 21, the Cooters will celebrate their anniversary hard and heavy at Proud Larry’s in Oxford. It’s their first gig since April, so expect some pent-up crunch. Longtime friends, a slightly longer-running metal band from Hattiesburg, Before I Hang, will play before the Cooters, with Oxford’s the Heard opening the triple bill. 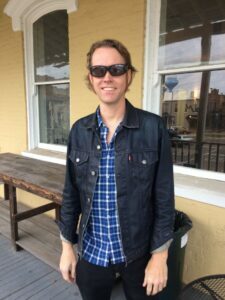 We touched base with Rayburn for a few questions, just because he’s the tallest guy in the band. HT: You were in several bands in the years immediately preceding the formation of the Cooters. Why do you think that the trio of you, Gentry, and Mikey stuck? Rayburn: A large part of it was that we were all from Oxford and knew each other really well. I had been playing with Gentry before Mikey came into the picture. And I had played with Mikey before I played with Gentry. When Mikey was ready to do the Cooters, I knew right then that we had the potential to last a long time. The Cooters, from left: Newt “Neuter Cooter” Rayburn, Mikey “Judas Cooter” Namarato, and Gentry “Raw Cooter” Webb. HT: Do you think it had also to do with the fact that the Cooters were more focused on songs rather than noise and jamming, which had been the format of your bands preceding the Cooters? Rayburn: I think that had a good bit to do with it. We still did a lot of jamming back then, but it was getting way more structured, and I was starting to sing a lot more, and I hadn’t up to that point. HT: You alternated between guitar and bass in bands before the Cooters. Why did you decide on bass? Rayburn: I really felt I was a bass player … And, believe it or not, when Gentry and I moved into the Cooter Estate in 1993, he was still a bass player, too. We started off with both of us playing bass, and I remember we were jamming and he’s doing all these runs and stuff, and I said, “Dude, just get a guitar.” So, he called up his brother and got his brother’s Les Paul and took to it right away. He pretty much learned on the fly, immediately. He was better at it than I was. He’s a great bass player, too, but I think I lay a pretty good foundation. He’s a great guitar player, and he’s just gotten better and better over the years, and he’s better at it now than he’s ever been. HT: How has the Cooters’ sound evolved in two decades? Rayburn: It’s definitely changed from before Mikey (before the Cooters formed). We were more trying to be like Sonic Youth—a lot of noise and improv. Then Mikey came into the picture, and we started getting heavier. He was really good at double bass (drums), so it was fun to write double-bass songs. The songs I was writing were heavier, too, like Neurosis. He took to that right away. Not long after we started playing with Mikey, we also played with Brad Boatright, who played with us for two or three years and is on our first record. He was a really heavy guitar player, too. We got heavy pretty fast in 1995 and recorded in Easley studios (Easley-McCain Recording in Memphis). Brad decided to move to Nashville and go to recording school. So we became the three-piece again and wrote a bunch of new songs and recorded The Moon Will Rise Again at Ardent in 1998. After that, we recorded Punk Metal at Tom Queyja’s studio The Lip, and then we recorded Chaos or Bust at Easley again. After that, Gentry looked at me and said, “I’m really tired of playing these long songs. We need to write some short songs.” So, we went on a tear. I was writing two-minute songs one after the other. A lot of those are on our album The Sound and the Fury, which has never been released on CD or vinyl, only online. The five or six songs that we’ve recorded at Winn McElroy’s studio, which are still pending, they’re not quite two-minute songs; they’re a little longer. But they’re our best stuff yet. Gentry wants to redo some guitar parts in December. I want to do a crowd-funding project to do The Sound and the Fury on one side and the new songs on the other side. What’s the secret to lasting 20 years? Rayburn: It’s probably similar to being in a marriage that long. It takes a lot of patience, understanding, love, and not sweating the small stuff. What was it like to record at Ardent? Rayburn: That place is magical. It’s the best studio we’ve ever recorded in. I was up there a couple months ago with George McConnell, working on his new record. It’s just electric. You walk in there and know you’re in the same studio ZZ Top and Led Zeppelin recorded in. You’ve got guys from Big Star walking around. You’re mind’s blown by the caliber of studio that it really is. I’d love to do another record there. I love that album, but I think our songs now are a lot better than they used to be.